Wealthy Chinese have fallen in love with France’s most treasured national product. Why aren’t the French happier about that? The Chengdu native was working as a translator at the Bordeaux Vinexpo in 2010 when she was invited to the annual trade show’s gala dinner. The foie gras, caviar and truffles she sampled that evening impressed her, but the wine—a Mouton Rothschild 2005, no less—tasted thin and acidic to her. Or at least it did until she got home that night and Googled the vintage. Li also realized something else: the dark red liquid she had initially found so unpleasant on the palate represented a career opportunity. The 18th century manor house where she lives, the Chanel hoops she wears clasped to her ears, the brand new Mini Cooper she drives around the Bordeaux countryside—they are all thanks to wine. 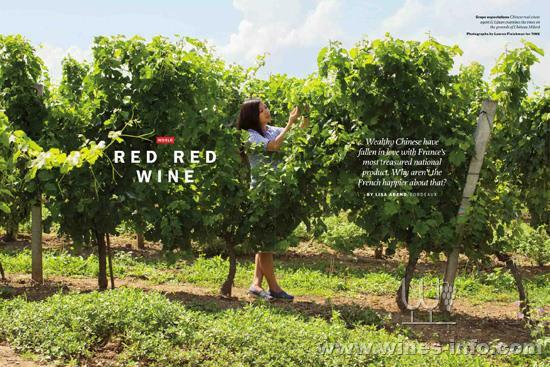 As a real estate agent who specializes in selling winemaking châteaus to Chinese investors, she owes her blossoming career in part to major shifts in the changing drinking habits—to say nothing of the social and financial aspirations—of her countrymen. Because just as Li learned quickly to acquire a taste for wine, so too has China. From 2007 to 2013, red-wine sales in China increased 136%. Last year alone, 1.87billion bottles were sold there, meaning that China has now displaced France as the largest consumer of red wine in the world. Most of the wine drunk in China—more than 80% of it—is made there as well, making the country the fifth largest producer of wine worldwide. Much of that Chinese wine is plonk, or worse. But among wealthy Chinese, there’s only one country of origin that will do—France. Bordeaux wineries now export 20% of their bottles to China, which has become the most important export market for these most storied of France’s wines. Increased demand from China is good news for the French wine industry, which has been suffering in recent years as France’s consumption of wine has continued to fall, from a high of 160 L per person per year in 1965 to just 57 in 2010. But the Chinese are not just buying wine, as Li’s presence in the region suggests; they are actively engaging with and, in some respects, transforming that most French of French industries, the wine business.These days, the prospect of wealthy Chinese investors buying up some of the West’s most emblematic products is relatively familiar: Chinese companies now own Sweden’s Volvo car manufacturer, Britain’s House of Fraser chain of department stores and the U.S.’s—and the world’s—largest pork producer, Smithfield Foods. But French wine is different. For the Chinese, it represents not merely a financial opportunity but also, through the purchase of French bottles and even châteaus, a chance for the burgeoning moneyed classes to stake a claim to some of the finest things the Old World has to offer. “It’s a useful obvious signifier of social status, urbanization and Westernization,” says Financial Timeswine critic and writer Jancis Robinson. For many French, wine is part of a jealously protected cultural patrimony, and some winemakers have mixed feelings as they look abroad for the financial assistance sometimes required to keep that patrimony afloat. These French needs and Chinese desires have helped shape a complicated and still evolving relationship that has sparked a winemaking revolution in China and has brought busloads of Chinese tourists to visit France’s most renowned wineries. The winemakers of Bordeaux and Burgundy are grateful for the trade, no question, but some French worry that they are somehow selling not just a dream and a taste of France but a part of their nation’s soul. Until the 1990s, wine was practically unknown in China, where citizens have long preferred to get their alcohol in the form of baijiu,a fiery spirit made from grain. Concerned with alcoholism rates and the toll that regular baijiu consumption was taking on its citizens’ livers, Chinese authorities in the 1990s began to promote wine as a healthy alternative. A Hong Kong–based businessman named Ko Tai Keung, who was then making a living by sourcing construction materials in Spain to sell on the Chinese mainland, was one of the first to take advantage of the campaign. Ko began selling European wines on the mainland in the 1990s. In those days, almost nobody in his native Shandong province (he moved to Hong Kong as a young man and moved back to the mainland 20 years ago) was interested in the stuff. Chinese customs officials had no idea how to tax wine imports, charging based on volume, not price. “At that time officials here saw no difference between quality and quantity,” he says. That would soon change. Ko’s entry into the wine business coincided with an explosive period of economic growth in China. Since the introduction of market reforms in 1978, GDP growth has averaged about 10% per year. Wealthy Chinese started traveling abroad in greater numbers and spending big on luxury goods—including wine. When the country joined the World Trade Organization in 2001, thereby reducing tariffs on many Western products, importers like Ko thrived. Ko realized that there were forces other than the sudden drop in price driving the growing demand for European—particularly French, and particularly red—wine in China. The connection in Chinese culture between the color red and good luck drove the market for cabernets and merlots (90% of wine sold in China is red). And the association of wine with Western luxury did the rest. “Many people here now see wine, particularly French wine, as a sophisticated and cosmopolitan hobby,” Ko says from his Beijing showroom, which, with its dark oak paneling and hanging lacrosse sticks, oozes Old World. Where Ko and other early adopters saw opportunity awaiting them in the vineyards and cellars of France, others saw a different way to profit from China’s growing thirst for wine—by making it closer to home. The amount of land in China occupied by vineyards grew from 300,000 hectares in 2000 to 570,000 hectares in 2012. The quality of most Chinese wines remains low, says Robinson, and there is “a great mass of fakes that aren’t even based on grapes.” Even the properly produced wines fail to excite. “The great majority are based on cabernet, often rather underripe cabernet because the farmers tend to pick too early with yields too high,” she says. “And many vines are virused, which prejudices ripening.” Yet a few producers are more ambitious, and Robinson predicts that the next five to 10 years will see some world-class wines coming from Chinese wineries. If and when that happens, it may well be because China is again looking to France—but this time as a source of oenological knowledge. Fields of Dreams yang jinyi had a dream one night in 2006. As a teenager in Beijing, Yang had never actually tasted wine, nor had he ever even seen a vineyard. But as he lay in his bed that night, Yang dreamed that he was drinking from a barrel of red wine. He didn’t know what the dream meant, but he could not stop thinking about wine. So that year he signed up for a viticulture engineering degree at Beijing’s China Agricultural University. “A dream is a dream,” the 25-year-old says. After learning as much as he could about wine in China, he decided he could only truly understand the industry if he went to its true home, so he studied French for a year and moved to France in 2011. Now studying at the University of Bordeaux, he will finish his master’s degree in oenology next year and is currently interning at Cheval Blanc, one of the region’s great châteaus. When he graduates, he’ll spend five years as what he calls a “flying winemaker,” working in Canada (ice wine—a Canadian specialty—is big in China) and Australia to learn about different styles of production. He’s not the only one asking that question. These days, French wine schools are full of Chinese students. In Bordeaux alone, there are roughly 3,000 Chinese students at any one time. Sixty of them study at the Bordeaux Wine Institute (a program in wine management overseen by the business school INSEEC, formerly the Institut des Hautes Études Économiques et Commerciales), making up 20% of the student body. “Two-thirds of our students go back to China after they get their degrees,” says program director Jean-François Ley. The Chinese tour buses that pull up daily to some of the region’s most wellknown châteaus testify to that. But there is another aspect of this newfound Chinese interest in wine that some in France are finding more discomfiting. In the past few years, the Chinese have begun snapping up not only some of France’s most prestigious bottles but some of the places that make those prestigious bottles as well. In 2008 the first Bordeaux château was sold to a Chinese investor. Since then, his countrymen have bought at least 70 more in the region, as well as a handful in other parts of the country, including the 12th century Gevrey-Chambertin, in Burgundy, which once made some of Napoleon’s favorite wines. Like many who work in Bordeaux’s chief industry, Baynes is quick to point out that the Chinese have bought only a fraction of the region’s 8,000 châteaus. “And none of them,” he adds, referring to the highest classification of wines, “is grand cru.”That may be of some comfort to those French who believe Chinese buyers are interested in French châteaus and vineyards only for the profit and prestige they bring. “What we learned, taking Chinese clients out to look at châteaus,” says Baynes’ business partner Karin Maxwell, “is that if they buy at the bottom of the market, they can produce a bottle for three euros and sell it in China as a luxury good for 50 euros.” Very few of her roughly 150 Chinese clients seem truly interested to begin with in the finer points of connoisseurship. “At the start at least, the Chinese were less discerning; they cared much more about the building than the vines. They only wanted places that looked like the fantasy.” Some of the grandest properties that Chinese wine investors have bought—including Château du Grand Mouëys, which is said to rest on the remains of a 1st century Gallo-Roman villa and was bought by businessman Jin Shan Zhang—have been turned into hotels. Some of the longtime producers in this area also worry that these new buyers will change the nature of the wine itself so as to better meet Chinese tastes. At the turn of the millennium, the trend in France was toward concentrated wines with a lot of tannins and wood. But “the Chinese aren’t used to high tannins,” says CIVB spokesman Château. “They prefer soft fruit. That’s the new taste of Bordeaux today. Less wood—to get more fruit.” He has no doubt that winemakers’ gradual adaptation to the preferences of the Chinese market will continue, just as it did for the American market before it. Any criticism of chinese investors and consumers tends to be muted in Bordeaux and other wine-producing regions, however, and for good reason: increasingly, family-owned châteaus are struggling to survive. Between the European economic crisis and changing French drinking habits(more and more French are drinking water and other soft drinks with meals instead of wine), it’s hard to make a living making wine. And fewer and fewer vigneron children want to take on the hard labor, rural lifestyle and low profit margins their parents would pass on to them. In that context, the Chinese can seem like white knights. Bordeaux winemaker Franck Labeyrie, for one, is looking East for a savior. The current owner—along with his parents—of Château du Coureau, Labeyrie is from the eighth generation of his family to make wine at the château. His grandmother still lives in the elegant, if worn, stone château, which features a 12th century turret, a moat and an interior decor that includes toile wall coverings and Louis XV chairs. Several months ago, he signed with Maxwell Storrie Baynes to sell Château du Coureau. He chose the company—and Li as his agent—in large part because he figured that a Chinese buyer would bring more money to the table than a local. During a site visit with Li, he says he also suspects a Chinese owner would be likelier to let him stay on as winemaker than a French buyer would. “I know there might be cultural differences with the Chinese,” he says. “But I’m nice, I listen well, I think we could do great things here.” He steps out onto the stone courtyard and mentions that it dates from Napoleon’s time. Then he catches himself and turns to Li. “They do know who Napoleon is, don’t they?”It’s a joke, but just barely. In Labeyrie’s desire to stay on as winemaker under a new owner lies not only his personal ambition but also a more collective worry that Chinese investors, with their perceived profit motives and lack of wine culture, will somehow dilute or corrupt France’s grand tradition. Some Chinese owners have shown that they are, in fact, forces for good, not ill. When Hon Cheung, owner of a Hong Kong–based property-development company, went looking for a château of his own in 2011, he knew he wanted one that could make him money. But as a collector and connoisseur, he was also driven by his long-standing passion for wine. He quickly settled on Château Mylord, a property that nearly borders the famed St.-Émilion area, separated only by the vineyard of the well-respected Lurton family. Cheung was convinced that with a little care, the terroir at Château Mylord could produce good wine—and besides, he liked the price. Before any of that could happen, however, Cheung had to overcome one obstacle—the sellers. The château had been in their family for five generations, but they had no children and were now nearing retirement. They wanted to sell, but, Li says, they had made it clear that they didn’t want to sell to a Chinese buyer. That was before they met the force of nature that is Li. By carefully arranging their interactions with Cheung (she suggested he host a private lunch for them; he dutifully did so), she showed them that he was at least as serious about wine culture as they were. And it didn’t hurt that “his first offer met their asking price,” she recalls. “That changed their mind!”Li is the only dedicated real estate agent for prospective Chinese clients in the region. In the Maxwell Storrie Baynes office, she has played a critical role in helping Chinese buyers feel less overwhelmed by French wine culture, and she has helped her bosses understand even the smallest points of Chinese etiquette. She understands that many of her Chinese clients are after the status-enhancing fantasy of a château, but she knows enough about wine, thanks to her degree in wine management, to help them find quality terroir. She also knows that many of her French sellers mistrust what she represents, but she has the business acumen to overcome their doubts. Cheung liked her ability to bridge the two cultures and hired her to manage his new estate. Which is how the girl from Chengdu came to live in an 18th century manor. But not even Li, as much as she is at home in Château Milord and in France, has fully left Chinese ways behind. One recent evening, after a long day of showing properties to the representative of a Chinese real estate developer, she returned home to Château Milord and kicked off her stylish stilettos. A Frenchwoman might then have poured herself a well-earned glass of cabernet. Not Li. She stepped into the kitchen, reached for a kettle and located a disk of pressed leaves. It was time for tea.